The project of Istanbul’s new mega airport, costing more than 10 billion EUR and being constructed by 30,000 people, is estimated to be able to handle more than 150 million passengers every year. With more than 15 million inhabitants, Istanbul is already recognised as Europe’s biggest megalopolis. Its size also makes for some quite impressive stats on air traffic at two of the main city airports: last year almost 90 million passengers travelled through both of them, the majority flying from Atatürk Airport and a lesser number from the city’s Sabiha Gökçen airport. An increased flow of travelers through Atatürk Airport and the lack of space were two major reasons for the consortium of Turkish construction firms to start building the third airport back in 2013. Planning for the mega airport was left in the safe hands of respected designers at Grimshaw Architects of London and the Nordic Office of Architecture from Oslo. The project’s design takes inspiration from Istanbul’s geographical position as the bridge between Asia and Europe, whilst at the same time being an intersection of international air traffic. The new airport is located 35 kilometres to the north of the city and stretches across 7,594 acres of land by the Black Sea. The airport will comprise of 6 runways, a giant parking lot for 70,000 vehicles and will be connected to the city by new metro and highway connections. Just to put all that into perspective, the current Atatürk International Airport only covers an area of 1,227 acres. The binding part of this mega project will be the biggest airport terminal in the world, which is slated to open next year. It will be able to accept 114 planes at one terminal, or 347 altogether. Plans also include building the largest Duty Free Shop in the world, which will spread across 53,000m2. The management of the airport for the next 25 years has been entrusted to IGA Airport, who will be paying a rent of 1.05 billion EUR per annum. Construction has been taking place in four stages, with the first stage anticipated to be finished by October next year, when the building of the new terminal will open its doors to an annual 90 million passengers. 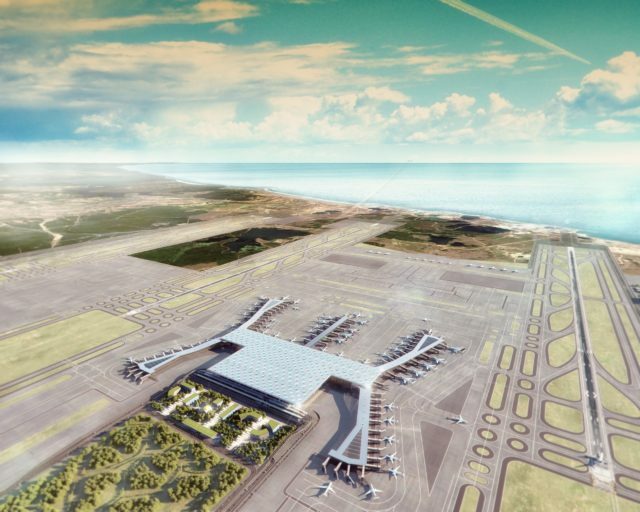 Building the second terminal and all of the accompanying facilities will follow after that, with the entire project expected to be completed by the end of 2023, when the Turkish nation will be celebrating the 100th anniversary of their new country. For the first phase, only three runways will be in operation and the airport will be able to handle 2,000 flights a day, but eventually a new city will grow around the airport that was initially intended for the 2020 summer Olympics that unfortunately Turkey didn’t win the right to host. According to the Daily Sabah magazine, 57% of the airport has already been completed and considering the project leader’s estimate of 120 million passengers travelling through the airport by 2025, then things already seem quite rosy for Turkey. If they do manage to reach that number, the airport will be the new world record holder, surpassing the Hartsfield-Jackson airport in Atlanta, the busiest in the world right now. Authorities also say the airport will create more than 225,000 new jobs, which is excellent news for the local economy. When we last visited Istanbul, plans of the airport were on special exhibition organised by Turkish authorities. Together with some other jaw-dropping projects, Istanbul will, without doubt, strengthen its competitive advantage on the international congress market with this new infrastructure. With its new airport it will become the meeting point for Africa, Europe, the Middle East and Asia.